100% beast whey protein is a powerful fuel to help increase mass and strength. This enhanced beast formulation packs even more protein and is designed with the highest quality Whey Protein Concentrate. Whey Protein Isolate, and Whey Protein Hydrolysate. At the same time the new powder formula only contains 4 grams of carbs-that's a 50% reduction. 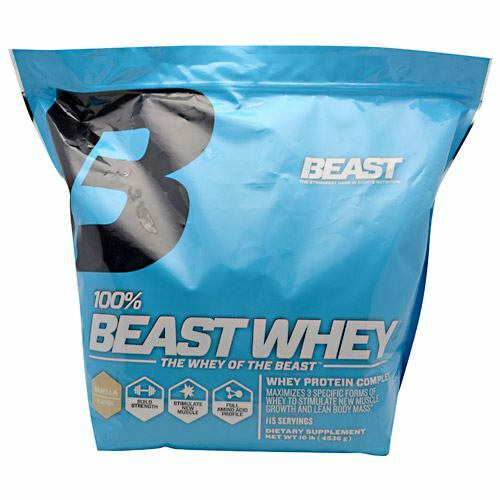 100% Beast Whey Protein delivers added benefits for increased fitness and strength. The three proteins are designed at different rates for better results. These proteins allow nutrients to repair, rebuild, and strengthen muscle tissue. Vitamins, minerals, and enzymes fortify the formula and pack an extra punch for health. The formula also helps the body retain nitrogen, which initiates protein synthesis to develop new muscle and increase lean mass, and maximize strength.